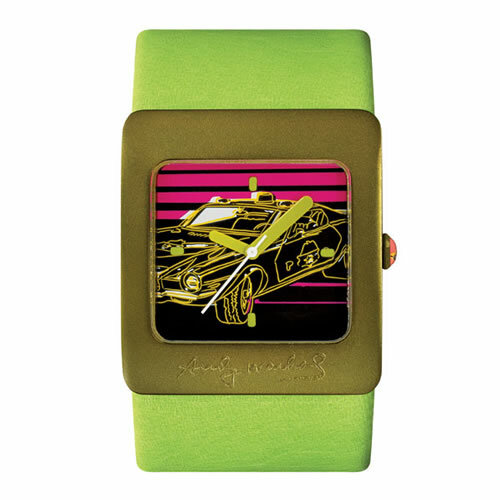 Andy Warhol Watch: Pop Collection "Police Car"
We're huge fans of Warhol's work, especially the screenprinted pop paintings. Now you can wear one on your wrist (so to speak) with the Andy Warhol Wach line. Officially licensed by Andy Warhol's estate, the watch features a plastic injection molded case with an etched Warhol signature, a genuine leather strap, and a bright color scheme. As much a solid timepiece as a collectible. Andy Warhol logo etched on case. This beautiful watch is presented in a gift box.